A written Office Policy is a must have to help implement a consistent approach to staff management. From a legal perspective, policies can be a fine tool in reducing perceptions of arbitrary treatment of employees. 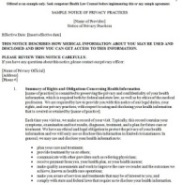 These forms MUST be used for your practice to be HIPAA Compliant. Don't get caught in a HIPAA audit without providing these forms to your patients. Use this rehab therapy evaluation form to simplify assessment of commonly seen muscle imbalance patterns manifesting in abnormal posture.